I have featured The Curious Cake Shoppe, a great source for baby items & gifts, previously. But crafter Tania Cardenas launched a new business several months ago called The Curious Canvas featuring unique works of art. Tania says that these canvases combine her love for graphic design, photography, & textiles into one neat little package. I love that they are so quirky & unique, refreshing for those of us who need a break from things that are so serious! Sew What is the perfect addition to any craft or sewing room. 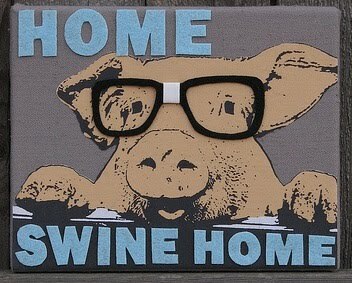 And I can't help but love the swine complete with spectacles (pictured)! In her "spare" time, she also runs DFW Craft Shows, a valuable site for crafters, as well as shoppers, in the DFW area. Visit Tania, who will be showcasing both of her product lines, at the 3rd Annual Funky Finds Spring Fling in March.